Rapid growth for the company you work for is exciting. Carus Group is growing, fast. We are winning Deloitte Fast 50 awards. We are challenging and leading the industry norms for environmental awareness. Things are very good for Carus as we head into our busiest time of year. From an employee perspective things are also good. The owners and management encourage us to participate in the quarterly strategy meetings. This includes the sales, operations and estimation departments all having their say. Here we work with our business coach to plan for the industries and regions where we can add value. I digress. Back to how we got it wrong. Rapid growth creates unique challenges. When you read the management books, or follow the guru’s online they talk about the challenges that rapid growth and expansion create. Cash flow, new equipment, new CRM’s and operations systems are required to drive the growth machine. The perspective is always from the viewpoint of the company. My question is, what about the challenges it creates for our customers? Part of Carus Group’s core values is to get it right, first time. Do what we say we’re going to do. Turn up on time, do the work in a professional manner and leave our customer pleased they chose to work with us. This week I had a client where we had missed on this promise. It was a small, simple job that had to be done after hours. The client had asked for the work to be done in a certain order. Some things were to be updated, some removed and some repaired. Most of this happened as requested but we got other things wrong. It was frustrating and disappointing for the client. It was from this disappointment, that I was most impressed by the response of the ownership of the company. It would have been easy to assign blame and point fingers. But that isn’t what happened. Our owner got in his car, took our senior estimator and met the client on site. There was no questioning what had been promised on the original quote. The mind set was, you’re disappointed, now let’s fix this. At the conclusion of the meeting a clear list of what needed to be finished and what needed to be improved was drawn up. At the conclusion of the discussion not only was the client satisfied that we would deliver on our promises we were asked to provide an additional quote for more work. Think of the customers needs first. They aren’t interested in our growing pains. Fix the problem, quickly and fairly. Don’t forget where you came from or what got you where you are today. Ask yourself, if this was your only customer, what lengths would you go to in order to make them happy? Then do that and a little bit more. Our company has grown from one office to six in just seven months. Last week was one of the most challenging operational weeks since Carus started four years ago. Our management team was hiring new national operations personnel, new painters and foremen across New Zealand. Despite this, when I brought the information that we needed to fix the relationship on a small job, the reaction wasn’t I’m to busy or that isn’t my job, the reaction from everyone was, let’s fix the problem. So yes, our goal is to get it right, first time every time. Carus has some of the most experienced paint professionals working today in New Zealand. What is more important though is to get it right for the customer, even if we have to go back and make this happen. We’re trying to grow by paying attention to every client, large or small. We’re trying to grow our business based on our professional, knowledgeable approach. We’re trying to deliver a quality result regardless to the size of the job. 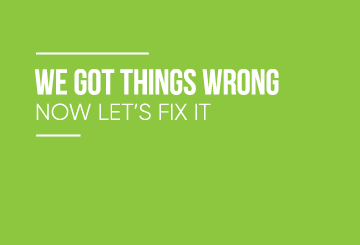 And if we get it wrong…That’s OK too. Why, because when the ownership, is driven to fix problems and admit when they can do better, so is everyone else in the company. Carus is currently hiring management, foreman and painters across New Zealand. If you’d like to work for a company that values doing it right, give us a call. If you are looking for a professional painting company who will work with you to get the job done right, we’d welcome that opportunity as well.